Donald “Don” Thomas Conroy, euchre extraordinaire, martini master, lover of family and laughter and always the most fun at any party, died at home, while surrounded by family on Wednesday, March 20th, 2019.
cold beverage. As they were leaving, a car full of beautiful east coast girls asked for some help with their dead car battery. Don, being the helpful and charming man that he always was, willingly assisted the girls. They quickly parted ways, but just a few days later they met up again, and the rest was history. From that car full of Navy guys and those beautiful east coast girls, three of the four couples married and spent many, many years making great memories together. Don married Dottie Reggiani on May 5, 1956 in Plymouth, MA. The two of them had two children (Dave and Rick) while living in Plymouth. In February of 1959, Don whisked Dottie off of the east coast and back to his hometown of Darlington, WI. He began working at Al’s trucking and they had three more children (Cathy, Karen and Carol). During their younger years, they spent time playing cards with friends, weekends at the cabin and taking family road trips to Massachusetts. Even though Don officially retired from Rock Road Industries, he never turned down an opportunity to hop in a grader or backhoe or grade the track at the Darlington Speedway after his retirement. Following his retirement, Don and Dottie spent many years traveling throughout the US and enjoying their grandchildren and great grandchildren. On most sunny afternoons, you could find them enjoying a cocktail on their patio on Mary Street, referred to by family as the “pazza”. Don followed fun. If there was fun to be had, he knew just where to find it. In the recent weeks, Don’s family has shed many tears of gratitude for the gift of life that we were able to share with him. He truly was a gift to all who knew him. He found the best in everyone and wasn’t afraid to let you know how much he loved you. He shared his love and quick wit with his family up until his final days. He was an avid Badgers and Packers fan. Grandpa will always be remembered for his many famous one liners and was a constant reminder to always value time with family, a good laugh and a well-mixed cocktail. He helped us understand that when playing euchre with those that you love, the score doesn’t matter because every game of euchre is a win, as it is about the time spent and the laughs that you had, not the final score. Those that knew him will never forget the impression that he made during his time on this Earth. He will truly be remembered as a legend and a hero. Survivors include his wife, Dottie of Darlington, his five children, Dave (Janet) Conroy of Janesville, WI, Rick (Karen) Conroy of Stoughton, Wisconsin, Cathy Johnsen (Ken Colden) of New Glarus, WI, Karen (Roland) Swintek of Port Orange, FL and Carol Thirsk (Eduardo Villalon) of Santa Fe, NM; seven grandchildren Shanna (Andy), Catie (Justin), Joseph, Taylor, Evan, Mykala and Andrew and two very special great-grandchildren, Hudson and Iyla . Don is also survived by one brother, Wayne (Diane) Conroy and many other extended family and friends. Don’s family would like to extend their gratitude to the staff and nurses from Upland Hills Hospice for their exceptional comfort and care, as well as all of those that visited and shared their love with Don and his family at home during his final days. Family Remembrances will be held Monday, March 25, 2019 at 11:00 A.M. followed by a Mass of Christian Burial at 11:30 A.M. at Holy Rosary Catholic Church a branch of Our Lady of Fatima Parish with Rev. Joji Reddy officiating. Military Rites will be accorded following the services by Bates-O’Brien-Howe-Wiegel-Roelli American Legion Post #214 of Darlington at the church. Burial will be in Holy Rosary Cemetery at a later date. A visitation will be held Sunday, March 24, 2019 from 2:00 P.M. until 6:00 P.M. at Holy Rosary Catholic Church and on Monday from 10:00 A.M. until 10:45 A.M. at the church. Online condolences may be expressed to the family at www.ericksonfuneralhome.com. In lieu of flowers, a memorial fund has been established in Don’s name. To send flowers or a remembrance gift to the family of Donald T. Conroy, please visit our Tribute Store. 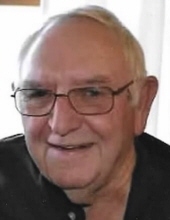 A visitation will be held Monday, March 25, 2019 from 10:00 A.M. until 10:45 A.M. at Holy Rosary Catholic Church. Memorials may be written out to "the family of Donald Conroy"
"Email Address" would like to share the life celebration of Donald T. Conroy. Click on the "link" to go to share a favorite memory or leave a condolence message for the family.